December 7, 2015 - Sawmills in Europe have had substantially higher wood raw-material costs than sawmills in other parts of the world over the past 10 years. 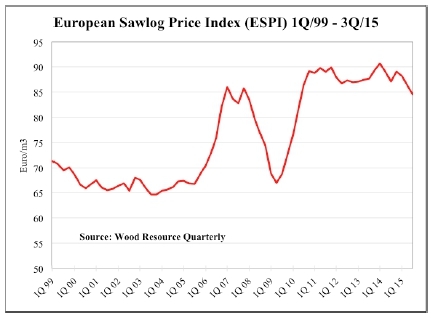 The European Sawlog Price Index (ESPI), a volume-weighted price index comprising average softwood sawlog prices in nine of the largest log-consuming countries in Europe, tracked the global sawlog price trend fairly closely from 1995 to 2005. After the Global Financial Crisis in 2008, sawlog prices grew faster in Europe than in the rest of the world. From 1995 to 2007, the ESPI Price Index was on average US$12/m3 higher than the Global Sawlog Price Index (GSPI), while from 2008 to 2015 the average discrepancy between the two Indices had increased to US$32/m3. In Euro terms, the ESPI Price Index experienced some dramatic swings from 2005 to 2010 (see chart) which were mainly driven by substantial fluctuations in lumber production on the continent. This period was followed by three years of fairly stable log prices until early 2014, when prices started declining. From the 1Q/14 to the 3Q/15, the ESPI fell by almost seven percent, a faster drop than that seen in other key lumber producing countries around the world. In the 3Q/15, the ESPI had fallen to €84.60/m3, the lowest level in almost five years, according to the Wood Resource Quarterly. Since early 2014, sawlog prices dropped the most in Austria, Germany, Norway and Latvia. Further analysis of log supply, demand, trade and pricing in Europe to follow in upcoming issues in the Wood Resource Quarterly.